I’m really putting it together propositionally and understanding the Nephilim came through Ham after the flood; and why Moses wrote so much of Genesis in God's Spirit in conjunction and relationship to Numbers and Deuteronomy when the Nephilim are so present. The judgment on the fallen angels already happened and they quit being with women - but the Nephilim who were the progenitors of that genetic disease went on all the way through King David when he fought Goliath. Israel was to utterly destroy them man, woman and child; it is crystal clear to me now and I am called to teach it hermeneutically. The concentration of the giants was no accident in the promised land, and so many also came from the Amorites where Sodom and Gomorrah was and also destroyed for homosexuality etc. The sexuality of the Nephilim was not in line with Gods Word. The Nephilim were a total genetic disease and not even human and were evil and a abomination. 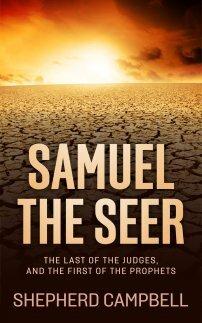 When you have time I hope you catch up on some of the audio studies like the 10 plagues in Egypt, the Passover and the last one on Israel in the wilderness - it will help you for what’s coming on the Nephilim and the killing of all of the seed. There are intellectual books like, "The Divine Genocide" criticizing the Bible as a totally evil book for saying Israel had a right to come into Canaan Land and take it over. Many, many intellectuals cannot deal with this. They embrace democracy as divine and say these tribes in Canaan land like the Jebusites, Hiviites etc had a right to self rule, and that is a divine axiom of relative revelation for our time. They have no knowledge of this genetically demonic plight with the Nephilim of Genesis 6 and reject that there is even a devil who constantly strategizes against us. man, technology, politics or revolutions bringing in the real change but Christ. I have so many friends who are caught up in this leftwing perspective of history and theology. They rightly criticize the rightwing greed and 1 percent game and corporate power thing but won't see the devil or Israel in prophecy. They embrace higher criticism and have a rabbits foot idol they call Christ that is totally phony. The bible really deals with the Nephilim and their off spring a lot especially with Israel coming into Canaan land...in the book of Enoch mentioned by Jude and Peter in the New Testament; it states that the angels that fell came into Mt Hermon and that is where Og ruled who Israel took out before they entered over Jordan into Jericho right before Moses died. The book of Numbers said Israel kept the bed of OG and displayed it, it was 14 ft long by 6ft wide. He was called a Rephaites and various names were given to the different Nephilim as they passed through the various tribes in Canaan land. “When the LORD your God brings you into the land you are entering to possess and drives out before you many nations--the Hittites, Girgashites, Amorites, Canaanites, Perizzites, Hivites and Jebusites, seven nations larger and stronger than you” JN Deuteronomy 7:1 names 7 tribes to be wiped out, it also seems the nephilim were used as mercenaries and all the Canaanites used them like the Philistines used Goliath. Latter on also these decedents were watered down and not as big as the original direct off spring in Genesis 6 before the flood....i believe Israel and Jordan is loaded with these bones.....google Og and you will see the tribe of Manasseh settled in his region and he was an Amorite close to the Syrian border along the border of Israel in the North of present day Jordan.....these giants were not just big men and some had 6 toes and 6 fingers a hand. I believe Israel and Jordan are filled with the skeletons and bones. i also believe the Nephilim food of our day with all this evil gene splicing is under judgment and if the Great Tribulation didn't stop it then it would cause a world catastrophe on it's own. The tree of the knowledge of good and evil has no ethics and it was where the serpent tempted Eve....this Franken Food will link with biotechnology and this Nephilim scenario returns but God will stop it. The bibe says, "as it was in the days of Noah so shall it be in the days of the coming of the son of man." 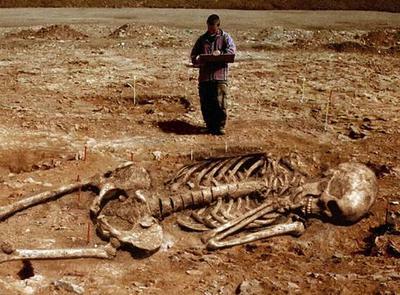 Do I think the old-time Nephilim and descendants are still on the earth today? That's a huge question but from everything i see biblically, no! The Angels that fell with women were judged and put into chains but the genetic seed went on, but the devil is trying to bring it back another way with the Monsanto ilk. Our times are mixing different species DNA and phylum’s and this is wrong. I don’t believe every tall person is a descendent from the Nephilim nor I do I believe in a small gene pool within nature. I also accept mutations that are genetically mishaps in nature and not demonic. I know some of this sounds like science fiction but examining the Bible closely, it just makes sense. Skeletons this size dont stay outside to get damaged. They are moved to museums, so where is this skeleton of this fake photo?